There are different options available when it comes to storing your caravan, but the main consideration should be what is the most convenient and secure storage facility for you. Did you know we offer caravan & motorhome storage on our UK sites? We have almost 3,000 storage pitches within secure compounds, providing security and convenience at a reasonable cost. To make it easier for you, our secure compounds are located at convenient points just off motorway junctions – making it easier for you to store your ‘van en route to your favourite destination. Whether you choose to store your vehicle with us or keep it at home, take a look at our top tips below for keeping your caravan or motorhome secure. If you have a garage or a drive you may want to consider keeping your touring vehicle at home. Keeping your vehicle in the garage is obviously the preferable option because of the greater security and shelter. Height and length are deciding factors with this option, especially if you have a motorhome. Coachbuilt conversions are upwards of 2.7m (9'0") in height, fixed roofs are around 2m (6'5") and micros range from 1.8m to 2m (5'9" to 6'3"). Caravans may generally be smaller in height, but both motorhomes and caravans can be quite long, over 7m (23'0") for the larger models! So you’ll need to know all your measurements to find out if garage storage is an option. Keeping your touring vehicle on your drive may seem like the perfect option because there are no obvious height problems, but it’s worth checking your local bylaws because there may be restrictions. It is also more difficult to secure your vehicle if it is parked on a driveway. 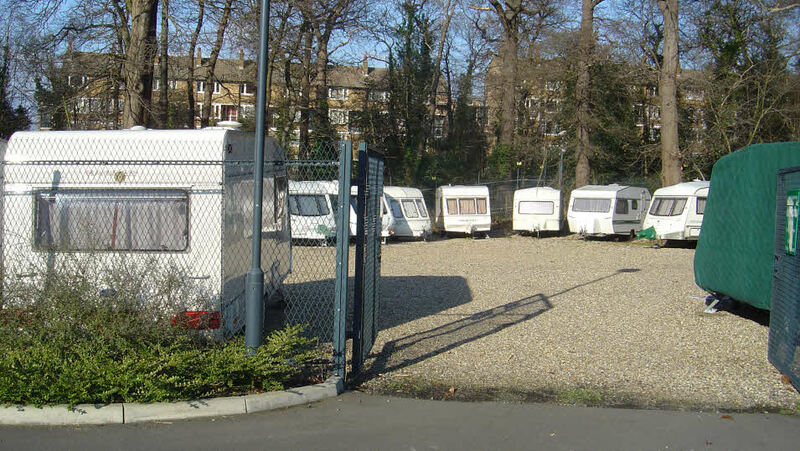 Maybe you have a favourite site that you go to again and again, so you might want to consider storing your caravan or motorhome on the site or nearby. If you leave your motorhome on site and drive to it in your own car you won’t have to hire one while you’re on holiday or ‘de-camp’ every time you go on an excursion. If you’d rather have your touring vehicle closer to home so you can tour anywhere straight from your door, then search for a site nearby. Some sites offer all year round storage but, if you plan to go touring for a large part of the year, you can reserve a pitch, just for you, throughout a specified period. Choose from a full season of around seven months or part season for just spring or autumn, leaving you free to tour during the summer. Most seasonal pitches are on grass and usually have electric hook-ups. The Club has almost 3,000 storage pitches within compounds on Club sites, providing security and convenience at a reasonable cost and under the care of Club Site Staff. Take a look at our Club storage sites or you can search for a storage site on the CaSSOA website or via Caravan Site Finder. Storing your caravan or motorhome at home may be convenient and cost effective, but many vehicles are stolen from domestic locations, it’s worth applying as many of these precautions to domestic storage as possible. Is your vehicle easy and convenient for you to access? If it is, it’s also very easy for a thief to get to it too. Neighbourhood Watch is a wonderful scheme and can be a very helpful deterrent. However, many residential areas are sparsely populated during the day, when most people are at work, so you might not want to rely on it as a security measure. A security post is a very good idea, and will block removal quite effectively. There are plenty of alarm systems on the market that include immobilisation circuits, ultrasonic interior sensors, perimeter protection to cab doors, self-powered systems and ones with both visual and audible warnings. Shop around for the best one to suit your needs and your pocket. An often overlooked aspect of security is that if your caravan or motorhome is parked on your driveway in full view, it’s absence when you’re off touring is an advertisement to thieves that your house is empty. There are a number of key security measures that a storage pitch should have in place for the protection of your vehicle. Perimeter protection - it’s obvious really but this is the first line of defence, and can take several forms such as: fencing, electronic beam, earth mounds, and water filled ditches. Access control - check the access points to the storage pitch; are they secured using a card control, multiple locks, or a key pad? Card control is probably the preferred and most secure option. Also check how many access points there are. Having a really secure entrance is all well and good but if there are other less secure exit and entry points it becomes almost redundant. In an ideal world the storage pitch would have just the one secure access point, where you enter and exit. Closed circuit television - CCTV is wonderfully effective, especially with a good video recording system. If the cameras are visible they act as a great deterrent. If the CCTV is being manned 24 hours a day then potential thieves can be stopped in their tracks, if the video recording is good then even in the worst case scenario, a touring vehicle being stolen, they will be able to get good identification of the perpetrators and successfully stop them getting away with your caravan or motorhome. Security lighting - another very good deterrent, but it is worth noting that poorly placed lighting can allow your would-be thieves useful areas of shadow to disappear into. Landscaping - it’s worth looking carefully at the landscape around your storage pitch. Low growing shrubs can act as a useful buffer zone, but tall trees near to perimeter fencing can be used as a natural ladder over it. Tall shrubs can also conceal perpetrators just like the shadow areas above. Fire risks - your gas bottles should be stored in a locked compound because they pose a fire risk. It is worth checking your storage pitch has the correct fire extinguisher for the protected risk. Legal Obligations - your storage pitch should be covered for public liability and occupier’s liability etc. but it is worth double checking and making sure your own personal caravan or motorhome insurance covers your vehicle while it’s in storage.